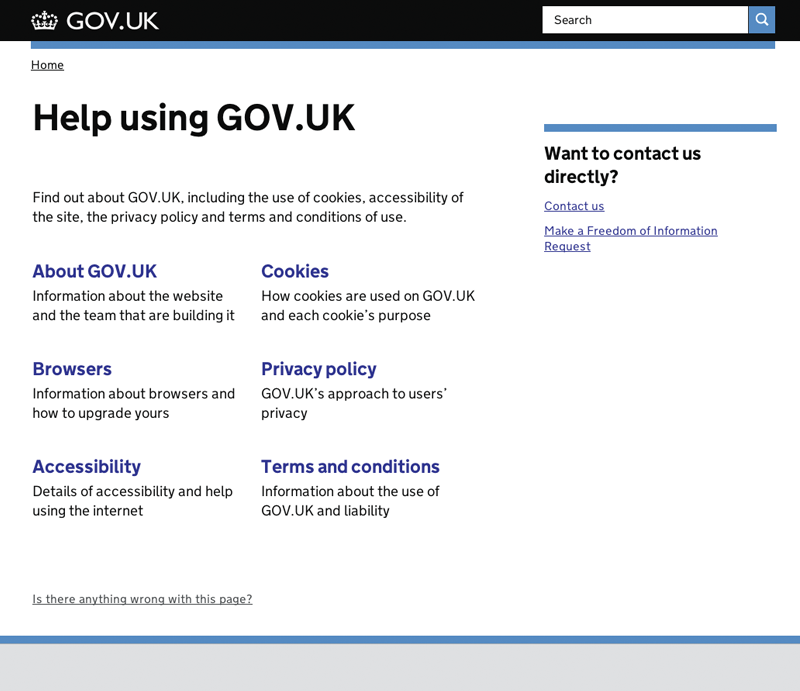 Right from the beginning of GOV.UK, we knew we wanted to provide a single place where users could get help using the site. We called it 'support', as the sections within it were broad. The content was originally gathered from product managers, Zendesk and press releases. With the release date looming, we took this ready made content and published it in the FAQ-style format it was already in. The content wasn't based on user needs, and as a result it has been performing badly ever since. Sarah Richards describes why we don’t recommend FAQs. Analytics showed that instead of users engaging with the content on the support pages, they were simply using it to navigate to the contact form. We also noticed that we were receiving a significant number of queries relating to other government online services. As these services weren't managed by us, a lot of resource was expended forwarding them to the correct department or agency to be dealt with. The generic naming of the section 'Support' hasn't helped this, with users assuming it to be support for all government services. 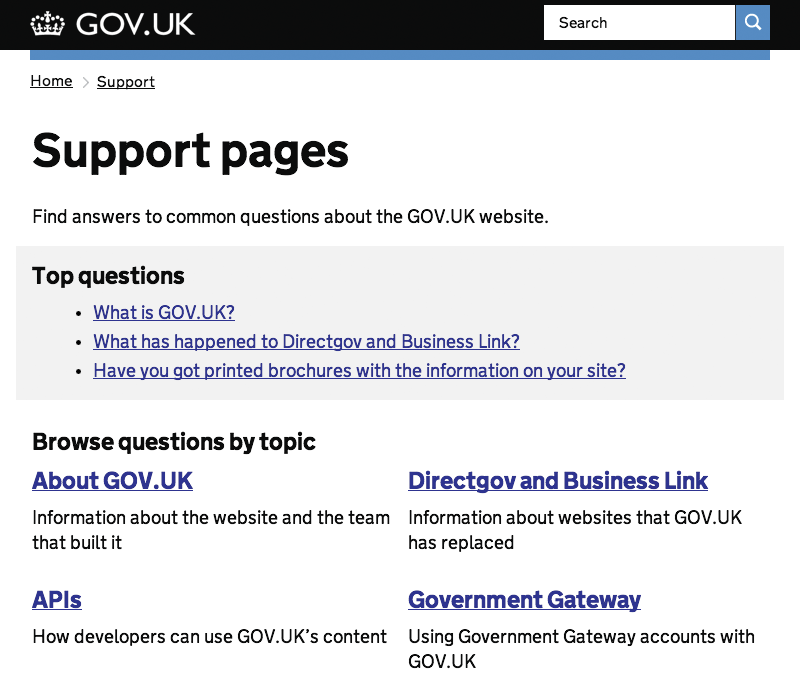 The new 'Help using GOV.UK' section is live, but it’s not finished. Over the next couple of sprints we plan to add a form to the index page allowing users to suggest what content they would expect to find there. We're also planning to improve the contact and FOI forms, which we hope to start soon. And we’ll also be monitoring Zendesk feedback from users and Google Analytics data to help us improve the support section in future. Hi. Good to see question and answer style has been replaced. Wasn't looking forward to explaining why GDS don't like FAQs but do that on the help pages! Will you be changing the wording of the link 'support' in the grey section at the bottom of every GOV.UK page? Hi Andrew. Yep, always glad to follow our own advice. We'll definitely be revisiting the 'support' link in the footer (and, as Amy points out, some other related bits and pieces like the contact forms, FOI, etc too). Just discovered insidegov. Up till mid Jan the GDS teams blog on the cabinetoffice site was the one where i thought all these conversations happened. You have this zendesk, which for me is the proverbial black hole. What I would prefer is a link to the right space in an online forum, where i could see the number people who were ahead of me, and read your answers before i have to repeat the same question. 1. Sorry to hear that Zendesk feels like a black hole. We've published our service standards for responding to comments (https://insidegovuk.blog.gov.uk/2013/10/24/gov-uk-support-requests-a-brief-guide-to-our-standardsurgent/) - and a guide to what to do if you don't get a response in time. 2. We're always looking at the 'is anything wrong with this page' feedback - and things like onward search terms - to find the questions that users are trying and failing to find answers to. Have you seen any examples of where forums have helped users in a similar context? Sorry this reply has taken so long. Been a bunch of stuff going on to keep up with. I hope you don't think I'm criticizing "the black hole". That's is way it always worked in the good old days. It's just that these days a community tends to build around questions, and there's no need (for a functionario, as my Spanish mates say) to keep answering the same ones, if you keep the conversations above the radar. So e.g. zendesk can be turned, from a black hole, into an online community pretty easily. https://getsatisfaction.com/corp/product/integrations/ (no, I'm not pushing getsatisfaction. It's just an illustration). If you'd like a few hundred other examples I can point to them, usually around communities who use forums for both support and research. Just choose a topic, add "forum", and Google.